Elevate your décor and see your guest’s faces light up when they enter your living room to see an industrial statement piece. A fully functional piece of art looks the part in your living room, bedroom, and in office or retail spaces. While other lamps use cheaper materials and only end up as an eyesore. 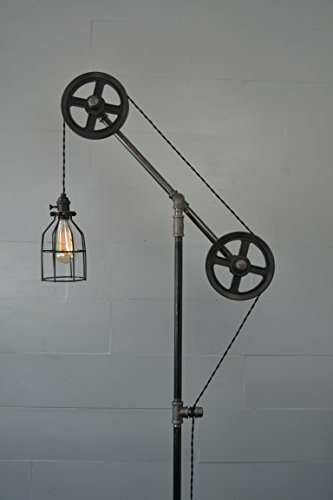 The Fayette’s Edison style design is lovingly constructed from real steel, the piece provides an authentic industrial touch to any room. The heavy duty base is 24” wide and made from signature sturdy steel. Set It Up In Less Than 5 Minutes! Easy to set up right out of the box. No tools or special equipment required, everything hand screws together. The 72” tall lamp is made in the USA in the heart of Pennsylvania. No special bulbs needed either, the lamp supports all regular bulbs up to 100W. The standard size light socket is designed for 120V usage, 240V is possible if you use a power converter. Our Stock Is Limited - Click “Add To Cart” To Avoid Missing Out!